The Cumberland Club of Nashville played as if having invented the game, athletic as Grecian youth on the Olympian field, excelling in every aspect, striking timely and well-muscled hits, and nabbing the spheres from the air struck by their opponent as if plucking from the air summer fireflies, one after the next. Victory was clearly and decidedly won on this day, from the bat-toss to the last recorded out. But when was this miracle game played? Sadly, ’twas two full weeks ago — a fortnight before the match upon which it is my regrettable duty to report in this dispatch. For on the first Sunday of June, at Carnton, against the seasoned Farriors, in the year of our common reckoning two thousand ten and eight, the Cumberland Club returned, like a dog to his vomit, to the ways of bad ballistry, falling 2 aces to 12. The batsmen in teal now sport a record of only one victory in six contests. A “farrier,” my friend Noah Webster informs me, specializes in the forging, shaping, and fastening of equine shoes, and on this day the Farriers ran roughshod over a bloodied Andrew Jackson crew. The score fails to relate the entirety of the dread debacle. 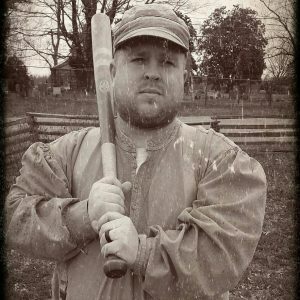 After loading the bases in the first without plating a run, the Cumberlanders would see only one solitary man running the bases over innings two through five, and the team did not secure their first tallies until the seventh frame. By this time, the gentlemanly Farriers were resisting tallying bunches of aces, and letting their backstop, Skeeter, record almost every put-out singlehandedly. This the former league official did in every conceivable way, catching orbs as they bounced behind the plate, snatching bloops backward into the air, and even sliding into a cloud of baseline chalk to spear a ball leaping with heavy spin near the Cumberland bench. This exercise resulting in the merciful last man dead in the battle, Skeeter was thence proclaimed the man of the match. Heroes on the side of the blue rivermen were harder to determine, but there were a small number of glimmers. No Doubt, making his Cumberlander debut, struck two safeties and made a balletic leap to snare a fly ball aspiring to get past him as he manned the short-stop position. No better catch was made in the field by either side. Maestro also found his batting stroke even as his teammates nearly all seemed to lose their own, striking two safeties in four turns. Captain Pepper also continued his recent tanning of the horsehide, with a pair of bingles himself. Finally, Ironbeard used his final turn at the dish to collect his first hit for the tealmen. At this rare opportunity to cheer, blueshirt partisans called for the ball to be taken from play in commemoration, before realizing they would have no other orb so new with which to complete the match. Perhaps this was but a fond wish of some who wore the sky-shirts against the Horseshoers on this Sunday, because it was clear that the horses they themselves had intended to ride had instead been left sleeping in the stable.